Irish Christmas tree ornament is a sleigh that is enhanced with green shamrocks. The Irish sleigh ornament is ready to hang on your Christmas tree. 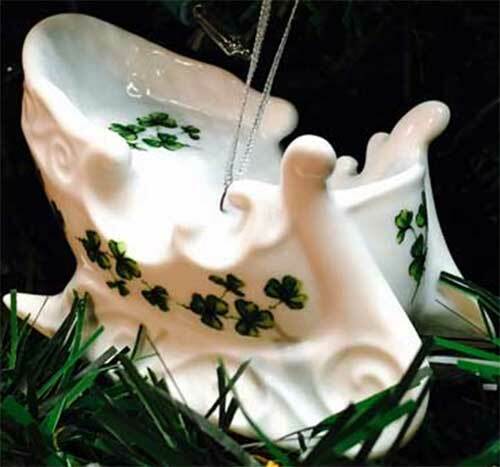 The Irish sleigh ornament features a white porcelain design that is enhanced with an all over shamrock motif. The shamrock sleigh ornament is a dimensional design that measures 1 7/8" wide x 4" long x 2" tall. Irish Christmas ornament is a sailboat with an all over shamrock motif. Irish Christmas ornament features a porcelain big rig truck that is enhanced with Erin Go Bragh and shamrocks.